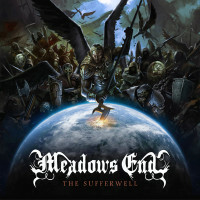 MEADOWS END, the Swedish Symphonic/Melodic Death Metal band, first came to my attention in 2011, when they released their debut album, “Ode To Quietus”. See my review here. Since then I’ve played the album many times, for the lads did make quite a catchy and entertaining album with a… charming production, so to speak. In any case, “Ode To Quietus” is an album to be proud of, and one to have in your collection. Several gigs and a few years later, album no. 2 is out and this since the 13th of June this year: “The Sufferwell”. This is again a self-release, as no label seems yet able to recognize the band’s potential and sign them. “The Sufferwell” was mixed and mastered by Oscar Nilsson (see his page on Metal-Archives.com) from Crehate Studios (see here), who gave the songs a powerful and tight sound. A big difference with the aforementioned “charming” production. Also, guitarist Stefan Sjölander was replaced by Rikard Öqvist last year. The artwork was again done by Fredrik Burholm (website). This new album opens with the piano melodies of “Kings Of Greed”. It’s a nice and calm intro, but then the Metal comes crashing in, while the piano carries on undisturbed. Talk about contrast! And so the transition into Blackened Death Metal verses is set in. For obvious reasons, growling vocals are a must and Johan delivers the goods. Let it be clear that MEADOWS END continue to rely on catchy guitar work and melodies. The orchestral input comes out in the bridge, along with a small choir, and the (fast) chorus. A small piano interlude guides the way for the guitar solo. However, and this is apparent on the entire album, the keyboards are then always pushed a little too much to the back, be that for the piano or the orchestral elements. After this obligatory part, all reverts to normal. Despite the little mixing detail (still, something to consider on a next release), the album has started very well. “Trench Of Souls” is a song with dark and threatening Metal. Add brass instrumentation (trumpets) and doom is nigh. The song also starts in a direct manner, no intro to build tension or anything. Midtempo pounding, growling vocals, … this is not FREEDOM CALL. Nothing wrong with this German Power Metal band, I’m just indicating the difference. 😉 The drum pounding doesn’t change much when the bridge is played. Here the symphonic input comes out a little more, while the chorus is where the music flows in a straight-forward way, not forgetting about the required bombast. There’s a clear distinction between the melodic role for the orchestrations and the metallic power of the guitars and drums. Instrumental talk is also given space, mainly halfway, before things return to what they were, with flawless connection. Two songs done, time for a ballad? That’s at least how “Ur Askan” and its soft, piano-driven intro makes it sound like. But then the piano is cast aside and sharp riffing and building drums have taken over. Slowly the song advances… and yes, the band does go into ballad-mode, for the piano returns, the music also shifts shape. But the growling is so out of place. Seriously. Clean vocals, whether or not with a rough edge, would have been better. In the chorus, it’s all about Metal, also halfway when the music does the talking. There is a choir in the back to ake the whole sound grander, fuller. And yes, it becomes bombastic, massive… heavenly, even. The obligatory solo follows a little later. Afterwards, like before, back to business, including the ballad-mode. All in all, another good song, save for the growling in the easier parts. “Devilspeed Loathekill” starts with a little tension, erupting into straight-forward melodic Metal dominated by heavy guitar work and firm drumming. The keyboards again operate from the back. No, really. The melodic chorus has a Black Metal-ish touch, I found. A bombastic piece precedes the solo halfway. The entire band gives its all, but those keyboards should have been a bit higher in the mix. They’re present, yes, but that’s about it, sadly. Even in the instrumental part afterwards the guitars and drums are too dominant. However, the song itself is another killer! In “Reap” MEADOWS END goes DIMMU BORGIR from the start, very bombastic and grand. Slowly the song again creeps onwards into the equally slow verses. More power is unleashed in the chorus. Brass instrumentation is applied later on, albeit for a short moment. Choirs are another element that add to the bombast of the music. All ends like it started. “Under A Canopy Of Stars” is an acoustic resting point, sung by Mimmi Berglund. A job very well done. Right when you’re in the mood for more of this, the bombastic (yes, the entire album is full of such music, it’s true) Death Metal of “Hung In Gallows By Dawn” unleashes its power. Pounding verses again remind of DIMMU BORGIR (for example), while the chorus is the part with which the song started, only now growling vocals are added. More musical expression of course completes the track. This is not for the faint of heart, as it’s one of the heaviest, more devastating tracks on the album. Violins leading the way in “This Coming Nightfall”, their strings being plucked. The Metal instrumentation copies the parts by way of bursts. And so the music fully opens into fast, symphonic Death Metal with the orchestrations and drums following each other on occasion. This is another brutal song, one of the more brutal ones on this new release. In terms of vocal input it’s not just growls, but also screams, especially in the chorus. A bombastic, choir-laden bridge is played before the whole slows down into drama, musical drama (the art form, not that the song begins to deteriorate). After this the pace picks up again for the rest of the track. A small step back, in my opinion, is “Funeral Of A Porcelain Doll”. The orchestrations are present, but the Metal isn’t as heavy as before. You could consider it as Hard Rock with a heavier sound. The melodic input from the keyboards is vital here, while the guitars chug on. More orchestral input becomes apparent after the expected solo part. It’s not a bad song, certainly not, but it lacks the cachet, the charm, the attraction of some of the other songs. A powerful start is also set for “Masses Flee”. And when you see footage of fleeing masses, it’s not like you’re listening to esoteric music like this here. The roles are clear: melody from the keyboards, power and heaviness from the guitars and drums. Speaking of which, there’s even room for blastbeats. Amidst the regular orchestrations, Robin added the piano or even a flute. The songs ends with bombastic, choir-laden Metal. Last but not least, “Insurrection”, the longest song here with its 7 and 1/2 minutes. It begins with a film extract, a scene in a church and someone being shot. The mighty sounds of symphonic Metal then break loose steadily, with a leading role for the organ. Obviously. In “Ur Askan” clean(er) vocals would have been better. The band did use (low) clean vocals… in “Insurrection”. As the music grows in volume and power, so change the vocals: clean makes way for growls. It’s a theatrical song, as in not just a song, but one you could use for a theatrical piece, a musical almost. Halfway the song the piano takes the throne again, guiding the clean vocals. If that’s Johan, then hats off for not sticking solely on his growling skills. Kudos for change and variety. 😉 The music afterwards also changes, this time unexpectedly into something Jazzy. In any case, no Metal to be found then. The solo is backed by a looped piano melody, to prolong this clean(er) break. However, all things come to an end, and to some things sooner than desired, as the threatening power of old returns and finishes “The Sufferwell” in style. “Ode To Quietus” was a very good and attractive introduction to this “new” symphonic/melodic Death Metal band from the North. With “The Sufferwell” the Swedes deliver the goods once more, in a more powerful and punchy fashion, the emphasis on heavy and destructive guitar and drum work, completed by grand orchestrations. MEADOWS END confirms their potential and raised the bar for themselves. The new songs are layered and demand more than a few spins to hear and grasp it all, but from the very first listen you’re sucked into this maelstrom of qualitative Symphonic Death Metal. In short, highly recommended album!